Opening the new year, Andreas Schreyer took over as the new Director for Science at the European Spallation Source. A career neutron scientist and former director at HZG’s Institute for Materials Research, Schreyer has long been active in the ESS collaboration in his role spearheading the German contribution to the project. 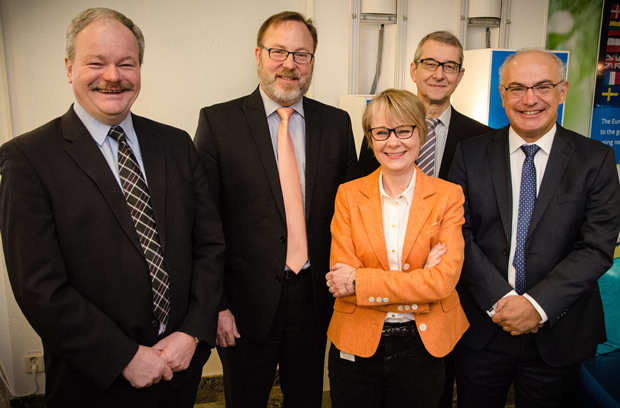 LUND—On January 11, Andreas Schreyer replaced outgoing European Spallation Source (ESS) Science Director Dimitri Argyriou, whose five-year contract came to an end. Professor Dr. Schreyer comes to ESS from Helmholtz-Zentrum Geesthacht (HZG), where he was both head of the Materials Physics division at the director level for the Institute of Materials Research, as well as the head of GEMS, the German Engineering Materials Science Centre. 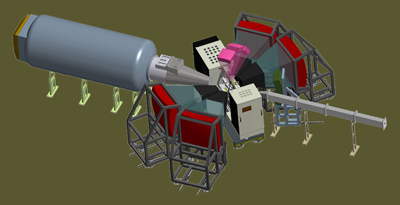 Click to read about the BEER engineering diffractometer selected to be built at ESS. BEER was proposed by Prof. Schreyer and Dr. Petr Lukáš of the Nuclear Physics Institute (NPI) and the Institute of Physics in the Czech Republic. Schreyer earned his PhD in solid-state physics in the 1990s at the Ruhr-University Bochum in Germany, using neutrons at the National Institute of Standards and Technology (NIST) in the US. His career path has since gravitated toward large-scale facilities through his appreciation of research and international collaboration. He has worked at Europe’s flagship neutron science facility, the Institut Laue-Langevin (ILL) in Grenoble, France, where he built the reflectometer ADAM for his studies of nanomagnetism. In 2001, Schreyer became a professor at the Institute of Applied Physics at the University of Hamburg, and was named head of the Materials Characterisation with Neutrons and Photons department at HZG. It was as a department head at HZG that Schreyer began to find his way to the centre of the German science community. He was responsible for the PNI (Research with Photons, Neutrons, and Ions) programme of the Helmholtz Association, the umbrella organisation of the German national labs that funds large-scale science facilities in Germany. Schreyer also managed HZG collaborations with the synchrotron X-ray source PETRA III at DESY and the Heinz Maier-Leibnitz (FRM II) reactor at Garching. In 2006, Schreyer became a director of HZG’s Institute of Materials Research and the head of GEMS, with responsibility for large-scale facilities. Here he managed work on applied materials design, instrument building and the facility’s user program. The major goal for the Director and the entire ESS management team during 2016 will be to deliver a firm schedule to the ESS Council for the engineering design, construction and commissioning of the first 16 instruments to be built at ESS. “By the end of the year we should be able to make a concise proposal that is aligned with our in-kind partners as to how we do it and which instruments should be finished by when,” said Schreyer. It was outgoing director Argyriou who saw ESS through the three-year, peer-reviewed selection process for these first 16 instruments, and who has brought the first group into the engineering design phase. While he will remain as Head of Operations Planning at ESS, Argyriou passes on the responsibility of scoping, resourcing and delivering the instruments to Schreyer and the ICB.